“It sounds like you need to pump up your tyres,” said my uncle as I complained about how much effort I found cycling to work, even though I’d been doing it for weeks and hoped I’d be getting fitter. I wonder if that’s true? I thought. How would I even know? I pride myself on being a self-sufficient kind of girl. I can mend most things. I can wire a plug. Hell, I’d even managed (albeit with supervision) to replace the spark plugs in my car. So I was rightly horrified by the realisation that not only had I never pumped up a bike tyre, I didn’t even know how to tell if the pressure needed checking. This was something I needed to do something about. 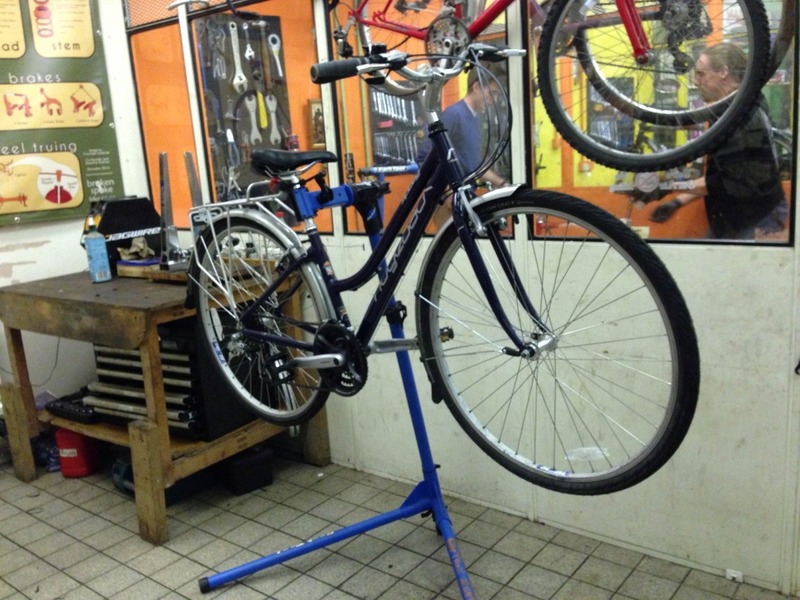 That something was booking myself onto Bike Mechanics 101 – a six hour course split over two evenings in the Broken Spoke Workshop. I was sceptical about surrendering my usual evening of crochet and E4 sitcoms, but put at ease by the offer of tea and a biscuit when I arrived. I might not know what to do with a bike, but these are two things I can very much get behind. Sam was running the workshop with the help of volunteer coordinator Meike. They started the session by talking us through some of the tools. I found that I was still in my comfort zone. I’ve owned far too much Ikea furniture to not know how to use an allen key. This was a theme of the course: everything was presented in such a way that it made sense and was something I could do. At no point was I forced to reveal how little I knew, but was also able to learn an awful lot. And I was able to learn in the way that I learn best: by getting stuck in and getting my hands dirty. (In fact, I wish I’d taken a photo of how mucky my hands were at the end of the evening.) “Right, now you do that on your bikes,” was a much repeated instruction, and the six of us scuttled off to try our hand with what had just been demonstrated to us, with both instructors close by in case we needed guidance. The first thing we learnt was how to repair punctures. Although despite all removing and replacing the inner tubes on our own bikes, we thankfully didn’t have to punch holes in those ones. We looked at a stash of already punctured inner tubes, and were each given one with which to identify the hole and glue on a patch. We then moved on to brakes: angling the pads, disconnecting and adjusting the cable, and giving it a healthy dose of oil to keep it lubricated. It was all stuff I might have worked out for myself by taking it apart. But I was thankful to have it talked through, and have someone check that everything was in order before I started cycling home. The second week was dedicated to gears: something I’d always assumed was mind-blowingly complicated but is actually quite simple when you take things apart and have a look. Like during the first week, we were given demonstrations before being told to try things on our own bike. I felt grateful for the opportunity to play with things and learn how they work, but was glad that there was somebody more experienced to watch what I was doing and check everything before I left. Since the course, I have a much better understanding of how my bike works. But perhaps more importantly, I now have the confidence to try and fix things. (If I’m unsure of something, there’s always the drop-in workshop). I feel more empowered regarding my primary method of transport, and less disconcerted by the feeling that it’s all going to go wrong. And oh yes, I did check my tyre pressure once I put the inner tube back in. My tyres say they can take up to 85 psi and each of my tyres were on about 35 psi. I can confirm that riding to work is now much easier.